Why hello there. Apologies for the delay in getting my next post up. I've had somewhat of a blogging break. I thought nothing better to get back in the swing of things than skin care, back to basics. 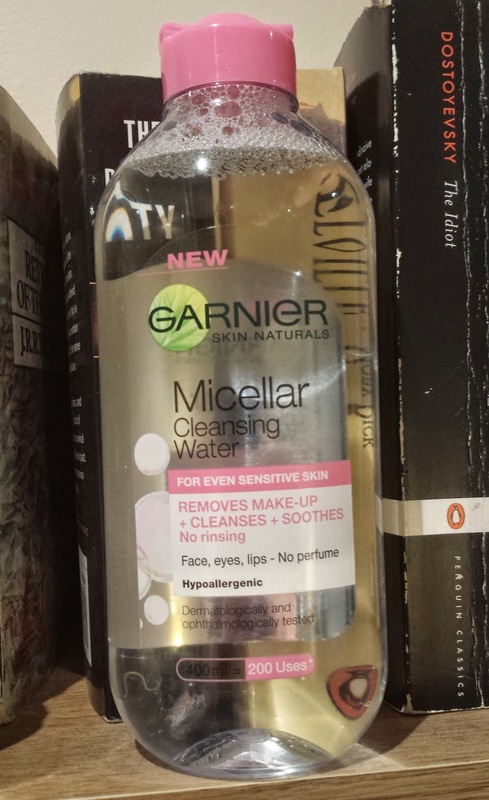 Without further ado, I present the Garnier Micellar Cleansing Water. This is Garnier's answer to the cult beauty cleansing water from Bioderma. However lucky for those of us in Ireland, the Garnier alternative is much easier to get your hands on (and much cheaper). Firstly lets look at the product itself, it is a little over €6 to buy a 400ml bottle (although at the moment it's one-third off in Boots). It is an all over cleanser, so you can also use it to remove eye make up too. It is suitable for sensitive skin and is fragrance free. It states you get 200 uses from 1 bottle, I think that is definitely overstating, the price is excellent for the amount of product! Now onto my impressions. I have used this for a few days now, so I mean I don't think my view is going to change all that much. I absolutely love this cleanser. It doesn't feel as drying as some cleansers while also not leaving that oily residue behind either. I find it easily takes off all my makeup. Of course as I'm sure you can imagine, if I'm wearing waterproof mascara, I will need to give it an extra bit of attention. But I find that this product does not irritate my skin or my eyes, which is of course very important. I have now added this to my skincare routine as the first step before I cleanse my skin with my favourite cleansing balm. I don't see it ever leaving my routine, unless something revolutionary comes along in the meantime. While this cleanser may not re-invent the wheel, it is a winner for me. It's a speedy way to remove my makeup, does not irritate and I do not need to use a separate eye make up remover. What more could a gal ask for? How about you, have you tried this water?